I know I’m not the only mom desperate to add more hours in the day. Heck – scratch mom – how about not the only human. I clocked a whopping 4 rows on my Wonder Woman shawl last week. Why? Because between work, overtime, academic team try outs, Cub scouts, working out, making dinner – I just couldn’t. How do you people seem to have it all together? How are the Pinterest moms attending yoga, making perfect cupcakes, sewing their child’s clothing, and and still getting promotions?! How?? I sometimes just pray I don’t forget to feed my tribe. I do this sometimes…. just stop doing the things I love. Why? I don’t know. I don’t know if it’s boredom, maybe a little depression, maybe just being overwhelmed. So then the things I love go away for a while…. That’s what happened to my knitting. 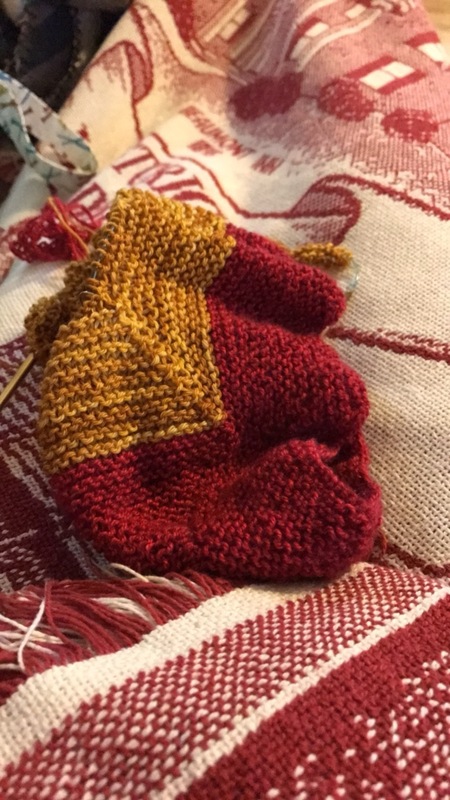 I’m pretty sure I didn’t knit for a year. Then, I finished some plain vanilla socks that I gifted my friend who left to live in China for a year. That got me going – back to where I was… and I found the Wonder Woman Wrap. I HAD TO KNIT THIS. I bought yarn just for it (first yarn purchase in over a year as well)…. And I have SCREWED this thing up a billion times. I don’t know how I have even done it. It’s freaking garter stitch and short rows – both I’ve done a blue billion times….. But I keep ripping out every single section and redoing. One section I couldn’t even figure out WHAT was wrong, so I just finally fudged some stitches. So, I’ll keep you posted – if I ever finish that! We also have a new family member I want to introduce – I think perhaps he distracts me! Meet Wicket. Named after an Ewok. 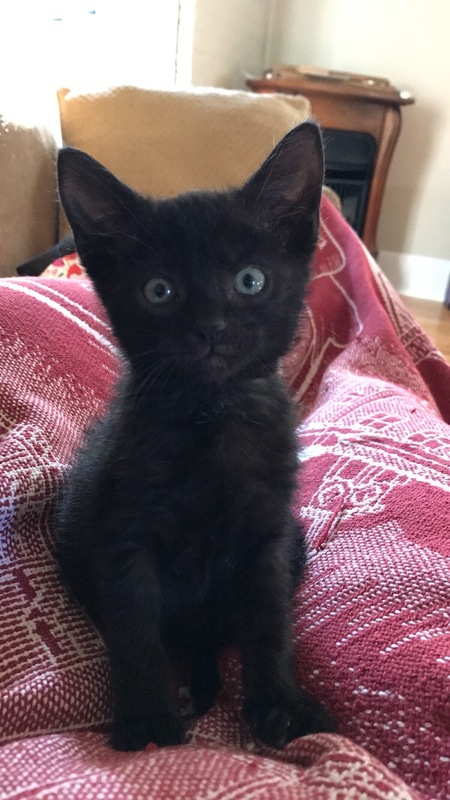 He was 1.1 lbs when we got him, and he’s full of energy and likes to lay on my neck, which does cause some knitting havoc. Well, I am resurrecting “I wish I were buffy” for the millionth time. I think this site is me, and who I truly am. It’s been me from the beginning…. So, I still knit, I still restore my old house, and I’m still doing all the things I loved. But, I’m working on my best WIP yet. Myself. Around Christmas, I was my largest size. A size 16 pant. So, I started calorie counting and some exercise. I mean, like modest amount of exercise. Walking. Slow. And it’s now March and I’m down to a size 14. Then, I decided after talking to a friend to try the Advocare 24 day challenge. I’m on Day 2. So I will probably be updating you each day. Letting you know how it is going!! I’m on Day 3 of NO COKE ZERO! And if I can do that, I’m sure I can do anything…. I still wish I were Buffy! After moving blogs a few times, changing my name to my business name “Loverbunny Designs”, I just haven’t felt it. I feel like when I blog under “Loverbunny Designs”, I have to provide you with knitting or dyeing or business information only. That’s not me. Not all of me. I sometimes want to talk parenting, and I sometimes want to talk about selling crap on Ebay, and sometimes I just want to talk about how I wish I were buffy. In the last few months, I’ve been touching back to my roots. I picked up a hobby I haven’t done for years. I have been rewatching Buffy! I’ve just been trying to figure out where I left myself. Apparently, this isn’t something that I only I have experienced. I have kept a friend I made in Kindergarten, and at age 36, we are still friends. We have been through it all – babies, a year or two of not speaking at all, husbands, breast cancer scares, and you name it. She brought it up while watching our kids play at the park — she had lost herself after having kids. I also had became acutely aware of this myself – the losing of myself after having a child. So to hear it VERBALIZED by such a close friend – it made me very aware of it’s TRUTH. Ok, so I’m rambling. It’s hard to explain what makes me – me. But it had been gone. And I’m getting it back. One way to do so is to TAKE BACK “I wish I were Buffy”. Because that’s still me to the core….. I will be moving my blog BACK to blogger. 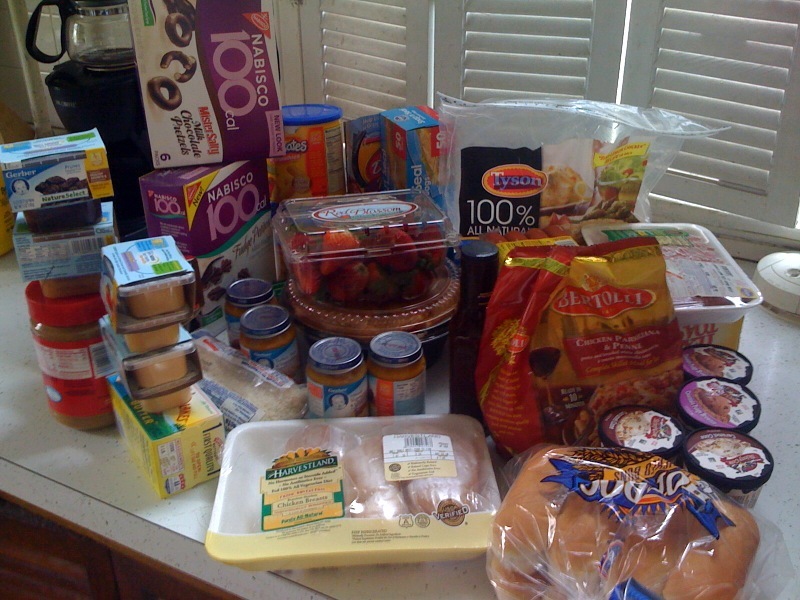 Well, I went to Kroger today and bought $109.17 worth of groceries for $35.93. I was so excited. It was a day where I needed stuff I didn’t have coupons for too, so I was super happy with my final total. Some more couponing strategies that I use include planning. When I first started using coupons, I didn’t always plan, but now that I do – I’m a lot more successful. For example, my coupon for aluminum foil today stated it wasn’t good for 25, 30, or 40 square feet boxes, so I wrote that on my list so I wouldn’t pick one up, then be surprised at the registar when my coupon wouldn’t work. Also, I find that planning and making a list keeps my buying habit in check. I don’t walk away with unnecessary things, like extra cookies or candies. And don’t worry. Planning doesn’t take all that long. A few minutes here or there. Make a list (I like to use my iPhone notes) of things you think you need as the week goes on. Then, when you are ready to go to the store, look at your list and see what coupons you have that match it. And you’ll save time in the store by planning at home. And it gets easier every week once you get the hang of doing it. And for all my yarn friends who think I’ve gone off the deep end, I am going to a fiber festival tomorrow, so I hope to provide you with some fun fibery goodness pictures! I said I would post a little bit about this – and I’ve really gotten distracted lately. My baby got ear tubes!! I was very resistant to it, but glad we got them. He had completely failed his hearing test, and at 9 months old – it’s important for his development to be able to hear!! He started really babbling and saying new sounds the day after he got them. So far, I’m happy. Someone asked about them not being high value – but I actually have gotten a lot of FREE coupons and high value coupons. Right now, I have a coupon for free barbecue sauce and a free package of hot dogs that I got in a package from Kraft. Sign up for samples from the companies, as these often have very high value coupons with the samples!!! Also, coupons.com is a very good site for coupons, and they are almost always higher values. Also, even if they aren’t high value, stores often double or have double days. My Kroger doubles all the time for any coupons under 50 cents. Drug stores are a completely new skill – using their cash registrar reward systems to roll your money and obtain free items when you add to your coupons. For example, this week at CVS, I bought Crest mouthwash, Pantene shampoo and conditioner, Kotex, and Carefree liners and ended up walking away with a profit of $2.00. I will link some sites that are great for couponing 101, and they explain this drugstore strategy. These are just a few of my favorites. Often you can find them on Facebook and friend them, and they update with all the new samples out or coupon deals and you can get it instantly to your Facebook feed. I hope this is enough to help some of you get started. Well, I really am still knitting. Even though I have nothing to show for it. Motherhood doesn’t stop you from doing the things you love, it just takes a little longer! I got some new needles, for socks, and I adore them. I got the Addi Turbo 8 inch circulars!!! They are so tiny, and I love them, but I think you either love them or hate them. I can go really quick on these things, and even the Cookie A. socks I love doing are going faster! I have really gotten into it, and doing quite well with it. I’ve not bought body wash or toothpaste, but gotten it all free after coupons, and have enough stockpiled for another month! Food is harder to get free – not as many great coupons, but still you can cut the bill a lot lower. If any of you are interested, I might do a blog post with some starter tips. Oh, and I got my laptop back. If any of you noticed me missing, my laptop died and was getting repaired. I have another OLD laptop, but it’s hard to use, heavy, and doesn’t have any of my bookmarks. Soooo… yay, my laptop is back! For Valentine’s Day, we didn’t do much. Went out to dinner last night to celebrate the Chinese New Year with some friends. I got a card, but most of all… I got sleep. I slept until 1 pm today. Oh, it was sooo wonderful. I haven’t done that in years. 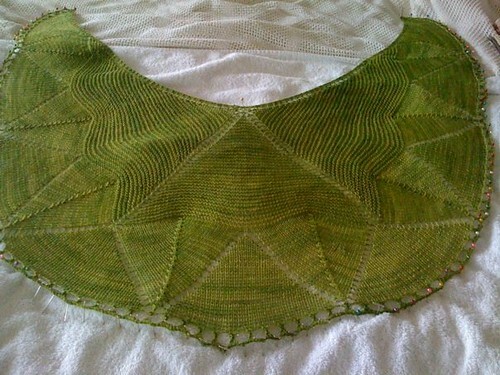 I also have been joining in the Ravelympics, and finished an old project that has been sitting in my knitting bag. Sad and all alone. Olympic knitting is so much fun, and so motivating for some reason!!! 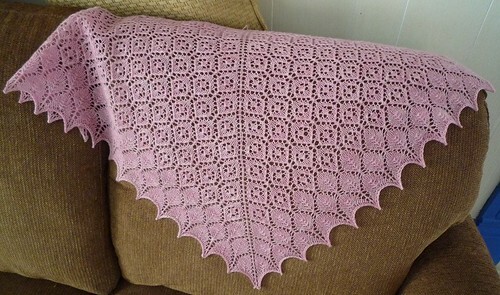 This shawl is from “Knitting Triangles” by Evelyn Clark, and is a mix and match of different patterns to make your own. This book is great, and is more of a recipe book for a shawl than anything. Great book, I highly recommend if you like lace knitting, particularly in triangle form. Malabrigo laceweight, in a really candy cotton pink. My favorite of colors. I’m definitely not girly until it comes to the color pink. 😀 Size 4 Addi Lace needles. Not much going on here. We’ve been a houseful of sickness. The baby has been sick, we have ALL had the stomach virus, and I officially tested positive for mono. Whee. I did get Damson blocked. Thank you Rachel, I used the spare bedroom bed, and shut the door to keep the kitties out and off the yarn!